the Princess Anne Neo-Natal Unit. A BIG THANK YOU to our customers for all their support and generous donations! THEY are proof it is the smallest things that take up the most room in your heart. Parents Karen and Jon Urben will never tire of treasuring little Emily and Grace’s matching grins or watching them sleep. That’s because their identical baby girls are incredibly rare ‘mono mono’ twins – which means as well as sharing the same placenta, they are also both together in the same amniotic sac in the womb. The condition called monochoriohic monoamniotic affects an estimated one in 65,000 pregnancies and the survival rate is just 50 per cent with only around 30 sets of ‘mono mono’ twins born successfully in the UK each year. Because there is nothing to separate them in the womb, the twins are at risk of getting entangled in each other’s cords, or being compressed by one another’s cords – endangering their oxygen, food and blood supply. There is also the risk of twin-totwin transfusion, where one twin takes all the nourishment from the other. But against the odds, little Emily and Grace did survive – and though prematurely born, they are healthy. Today the twins have celebrated their first birthday and though the family are used to people stopping them wherever they go, few people know that, in fact they are even more special than first appearances: the girls have never ever been apart. “Sometimes miracles do come in pairs,” says Karen. Karen, 37, and Jon, 39, said they had been trying for a baby and were overjoyed when they fell pregnant – and discovered they would be having two. Jon says: “Suddenly everything changed. It was 9.30am on a Monday. "Karen didn’t experience any pregnancy symptoms, so we were half expecting there to be nothing there. However that overwhelming joy turned into fear. The 16-week scan with senior consultant Dr David Howe revealed there was no membrane between the embryos. “He told us the twins – who were identical – were in one sac with nothing separating them. “He drew a picture for us and said the pregnancy was ‘high risk’. We knew instantly what that meant. “I asked if there was anything I could do. “He just told us that if I felt unwell or something didn’t feel quite right, I must go to hospital straight away. The couple, who live in Southampton, said they did not dare do what most first time parents do, excitedly hit the shops for baby supplies or give the babies nicknames. Instead each night Jon would try to listen out for both heartbeats when he rested his ear against Karen’s bump. And while for most mums the joys of wriggling babies in their tummies is a reassuring highlight of pregnancy, Karen would secretly hope they didn’t move about too much in case they became tangled. However the couple were determined not to let their darkest fears occupy every waking thought so they kept busy. 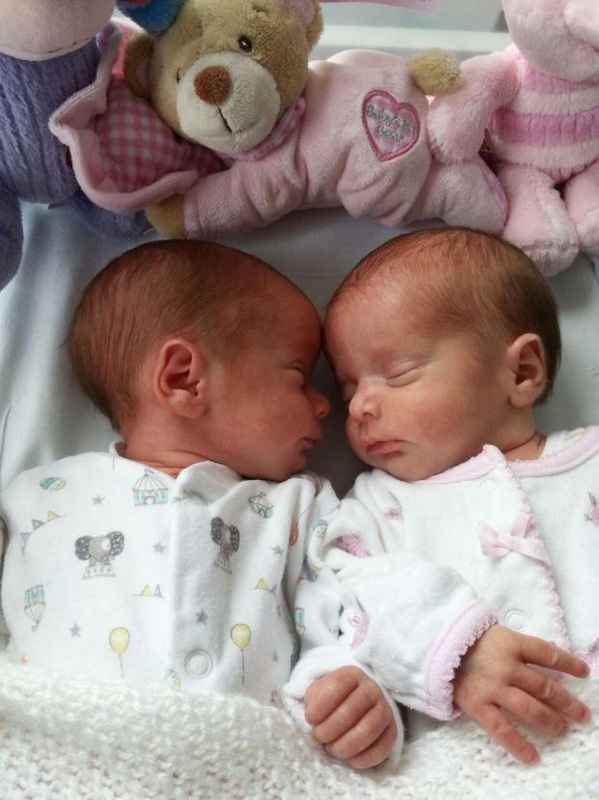 They took each day at a time and before long they reached the fortnightly scan with their consultant, necessary to find out whether both twins were still alive. Every time the midwife or consultant heard two different heartbeats, Karen and Jon ticked it off their calendar at home and soon, they reached major milestones. “It was frightening, of course, but we just kept as busy as possible doing what we’d normally do. We knew there was nothing we could do so we had to get on with it. “I felt lucky. I wasn’t sick and everyone was just brilliant. “The big help for me was working to keep my mind off it and the midwife and doctor were amazing. They were at the end of the phone at any time,” says Karen. 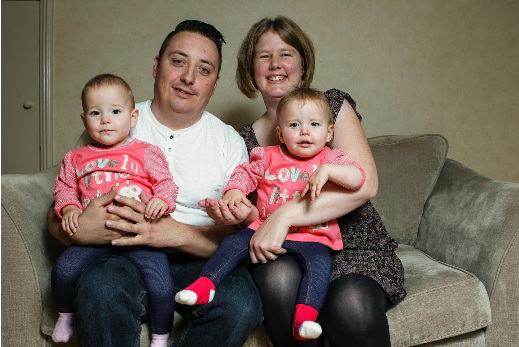 The couple knew delivery would be no later than 34 weeks due to the risks and Karen was given steroid injections to help the twins’ lungs develop. Emily and Grace were born on July 26 within a minute of each other. Emily was born at 10.22am at 4lb 5oz. Grace, was 3lb 13oz and was born at 10.23am. “They were screaming away and it was such a relief meeting them. They were so tiny. Their skin was like paper. Because the girls were so small they spent 17 days in Princess Anne’s Neonatal Intensive Care Unit before being allowed home. Fourteen months on and the girls are a picture of health. Karen and Jon say their experience has meant they treasure the small things in life like seeing the girls giggling at the animals in their favourite book The Zoo, jigging about to their favourite programme Waybuloo and laughing when their daddy tickles them. Karen, says: “They are our little angels, they are very special. "We want to say thank you"
THAT’S the message from Jon and his colleagues at New Century Bingo Ltd in Shirley who are this week organising events to raise money for the Princess Anne’s Neonatal Intensive Care Unit (NICU) Jon, who is assistant manager at the club, said everyone in the community is coming together for the week-long event. Today from 10am until 11.30am and again from 3.30pm until 5.30pm staff will be offering car washes for £2.50. Throughout the week the team will take it in turns to cycle the equivalent of Land’s End to John O’Groats on an exercise bike. Staff will have an option to work in non-uniform in return for a donation. And there will be various raffles, quizzes and auctions in the bingo hall. Throughout the month customers and colleagues will be knitting baby clothes and accessories for the unit. Jon says: “The bingo club wanted to raise money for a charity, and what better charity than helping all the babies in the unit, and don't forget some of the babies there are not just small they have other problems which we witnessed first hand. NICU provides specialist care to sick and premature newborn babies. The state-of-the-art facility is located at Princess Anne Hospital and has 36 cots, 20 high dependency cots and 16 special care cots. It is one of the largest neonatal units in the country treating around 750 babies a year from the south. To donate to the unit go to southamptonhospital charity.org or call 023 8120 8881.